The Long Tall Texan did much of the actual building, and when we moved in we continued to work on the house. We had sold our previous home so quickly we had to move into a rental house, then had to move from it because it was sold. The inspector said he would sign-off our final inspection once two more things were finished on our new house. 1] The kitchen cabinets had to have a finish. We went with a clear polyurethane finish. 2] A set of steps had to be installed outside the living room French doors. Otherwise, when you opened the doors you fell about two feet to the ground. We worked late into the nights leading up to Labor Day weekend, our deadline for moving out of the rental home. Rushing against the clock we were ready for what we hoped was our final inspection the Friday before Labor Day. The house passed, and we moved in over Labor Day weekend! With so much more to be completed. The first room in the house that was finished the way I envisioned was the guest half bath located off the front entry hall. The visible closed door leads to the utility room. I would go stand in this bathroom to enjoy that it was finished since no other room was. We installed the wallpaper on the walls and the ceiling over the Fourth of July weekend. We were a regular comedy duo, one of us on a step ladder and the other standing on the toilet seat as the ceiling wallpaper continued to fall back down onto our heads. After hours of working my arms ached from holding wallpaper above my head to attach it to the ceiling. Finally, we got the ceiling wallpaper installed. And we laughed about it with our family later, much later. At the time we were installing it, I was pretty close to tears more than once. Look up at the top of the photo to see a little bit of the ceiling wallpaper that is still attached almost thirty years later, holding strong. 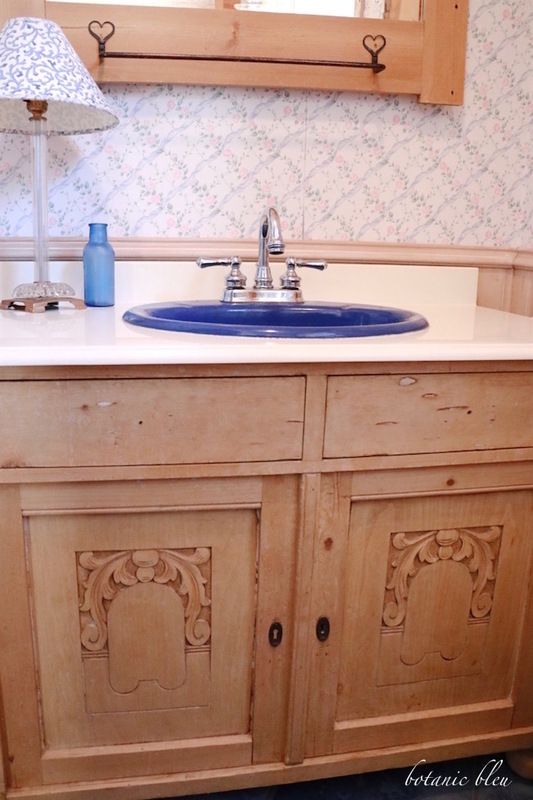 A vintage pine washstand holds the sink. I scoured antique stores in Forney, Texas looking for an antique pine cabinet to repurpose as a vanity. 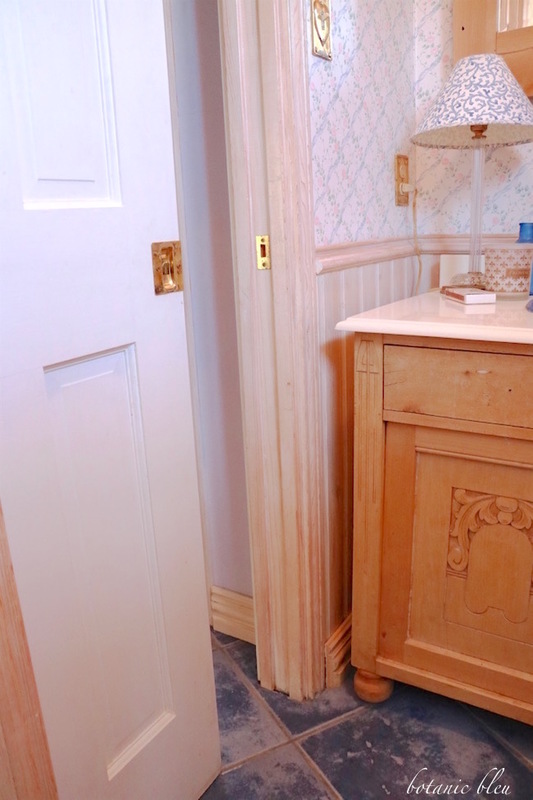 The day I found the hand carved art deco washstand, I also found this antique pine mirror that once had been attached to a different washstand that was missing. We attached the black iron towel holder. Still standing outside the bathroom door, but looking toward the opposite wall from the sink is the toilet. The trim around the window matches the white-washed bead board half wall and baseboards. Over the years the pine posts and beams have darkened and look much redder than when they were installed. I love the wallpaper with its blue ribbons and pink roses forming diagonals, but there a few places the edges have lifted from the walls. The solid six-panel pine pocket door still works perfectly and needs only a little touch up on its white paint. 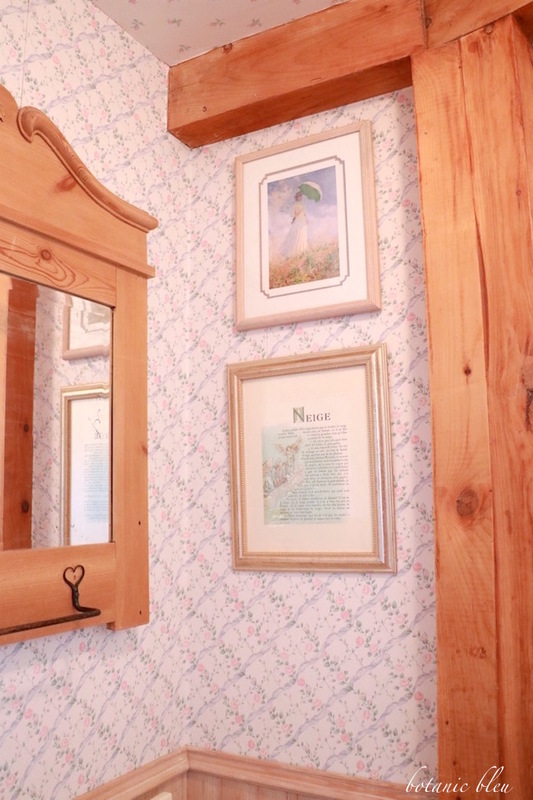 You can see one of the round feet of the pine vanity. The original feet were battered, and the Long Tall Texan turned new feet on a lathe to replace the original ones. The blue floor tiles are in pretty good condition, but the grout is not water proof and is impossible to clean. Plus, tiles in both the adjoining entry and utility room include cracked tiles. The flooring needs to be replaced. Here's the plan for changing the American Country look to a French Country look. A check mark (√) indicates what has already been done. A question mark (?) means final decision not made. Replace the flooring in the utility room, entry, half bath, stairwell, and kitchen so that all of the spaces have the same continuous white ceramic tile flooring. Use water proof grout. Tile has been selected, but not bought/installed. Replace the beige standard height toilet with a white tall toilet, seat height 16.5"-17". 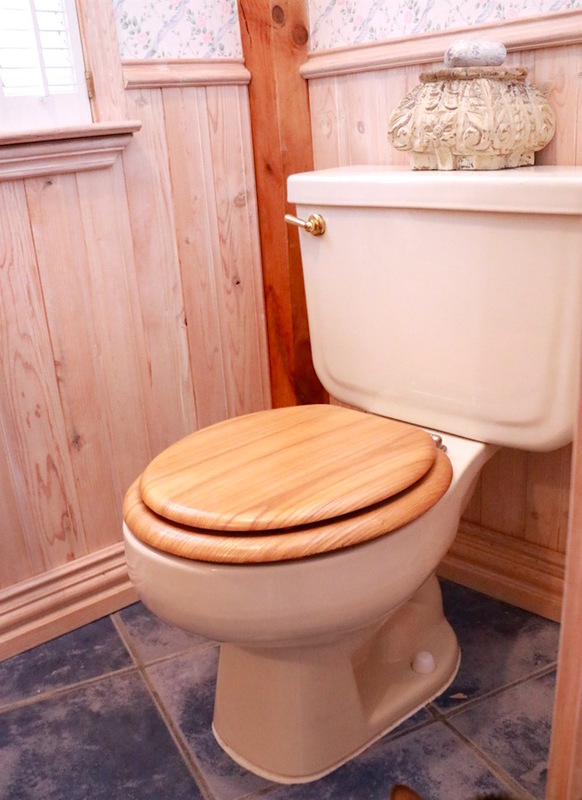 Replace the wood toilet seat with a white toilet seat. 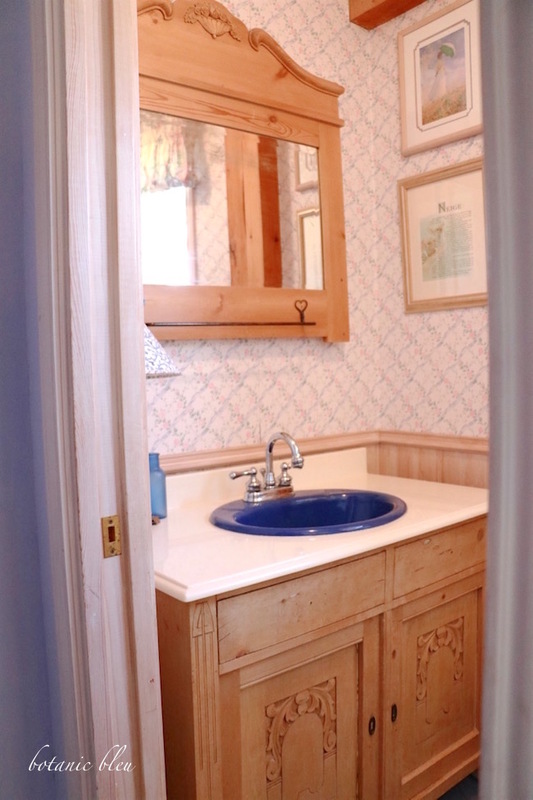 Keep the sink, faucets, and vanity. Install hardware on the vanity. Remove the curtain valance from the window. (√) Keep the white shutters. Paint the window and window trim white. Paint the pine posts and ceiling beams white. Paint the door trim white. Paint the toilet paper holder white. 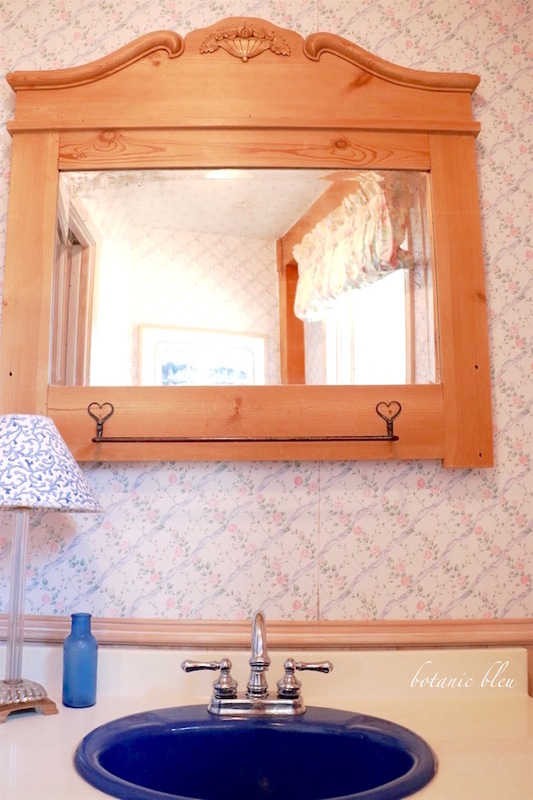 Paint the towel holder white and install on the wall to the right of the vanity. Keep the ceiling light fixture. I hope you will watch for periodic updates on the progress of changing the half bath from American Country to French Country. Target completion date is sometime this summer. The biggest project is the new tile floor which I will have a contractor install. But, before the tile can be installed, the living room oak floor needs stripping and refinishing. The living room wood floor refinishing needs to be done first in case the adjoining floor where the new tile will be installed is damaged. Would you like to see more of the house, and how it has changed over thirty (30) years? I will be sharing how Spring looks in my French-inspired garden shed. The vanity is definitely a keeper! I love the carving. Looking forward to seeing your planned transformation for this room. Have fun with your makeover. Looking forward to seeing your changes. 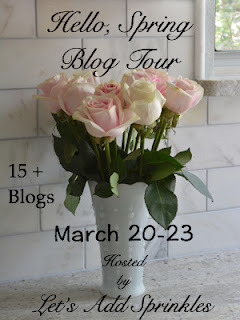 I love French Country Cottage blog's home and would love to just move right into it, so if yours turns out anything like hers I'll be drooling. That is a classic style bathroom. You did so well to have it look cute and classic for 30 years. Well. done. I can totally relate to the wall paper project. Wow. I can't wait to see the changes. I adore that vanity. 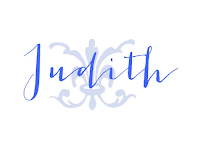 Misery loves company, Judith, lol. My motto? I'm moving, and going nowhere. As everyone has cheered me on, I will do the same for you. We just have to keep our eye on the prize at the end! It's held up great for the 30 years you've had it, and I'm sure it'll be great once all your ideas are implemented. I would paint the vanity and mirror in a distressed antique white in a heartbeat. They are made for a French transformation. The mirror is perfect for it. Whatever you do will be pretty. Oh yes! I would love to see your changes over time. Your home is so beautiful and light filled. I'm certain all of your decisions will be perfect! I love that vanity! Ow, my shoulders hurt just thinking of trying to wallpaper the ceiling! I think a beadboard ceiling would look good in there but the wallpaper works! And yes! I'd love to see more of the changes your home has undergone. I love before and afters! 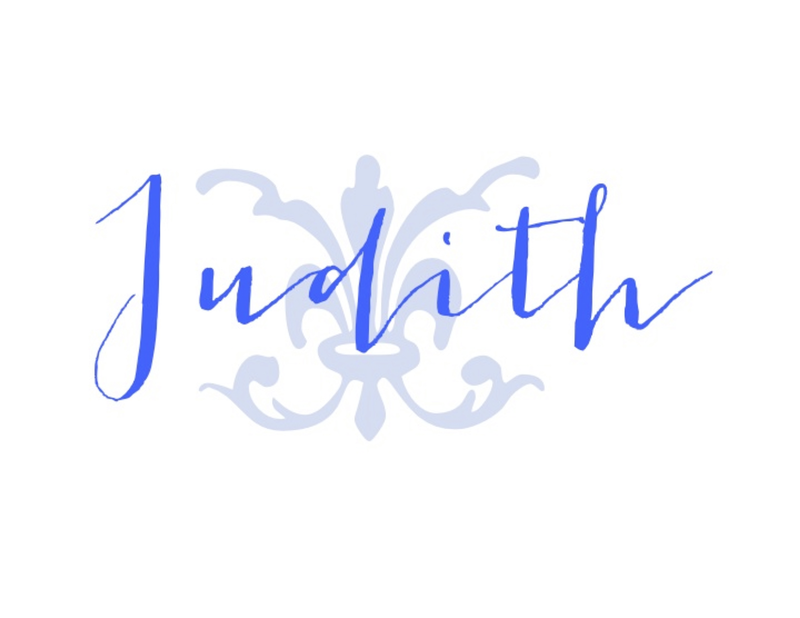 Judith, that vanity is gorgeous! I cannot wait to see the progress and the end result...I know it will look beautiful! All of the changes we make to our home seem to be intense "labors of love" but so worth the effort! I'm excited for you and will watching the progress! Love and hugs! 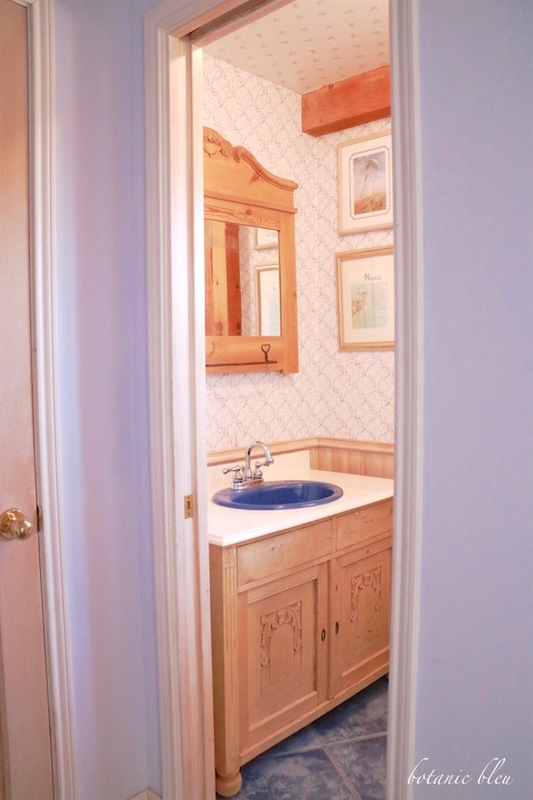 That is a very interesting vanity and I spy some serious trim work in that room. 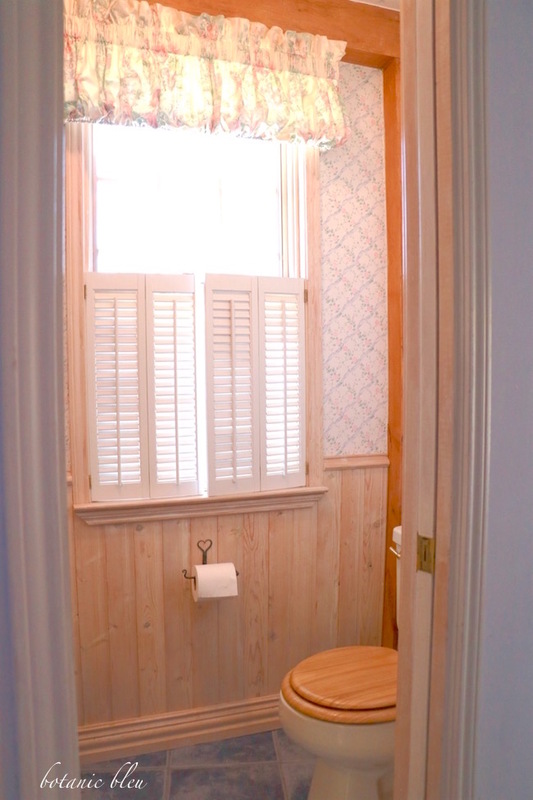 I'd love to see what you do with the guest bathroom. I would LOVE to see more of the house and the various changes you've made. Our house is 37 years old and over due for some refreshing, repairing and replacing!! I need all the inspiration and instruction I can get. The detail on the vanity is gorgeous. It's a keeper, for sure.